Bouncy castle, Land Zorbs, cars and roundabouts. The egg and spoon race will be back along with the sack race and more. One of the highlights will be the Helicopter rides, which are always popular. Along with everything else, there will be face painting, Hunt the Lion, The Lions Sausage Sizzle, Food and Drinks Stalls. 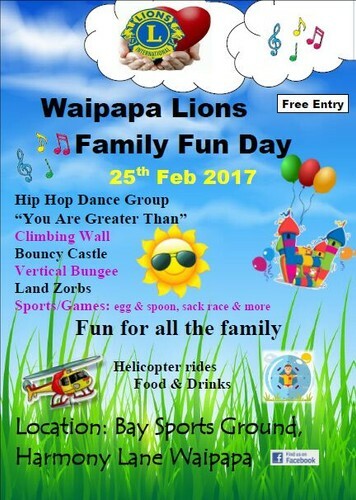 Waipapa Lions are pleased to put on this event for the Northland Community and invite all families to a fun-filled day out that starts at 10am. Hope to see you there. Find us on Facebook.